If you didn’t land the job after your last interview, it might have been because you were not wearing this sweet Kraftwerk-inspired necktie. Although our own [Caleb Kraft] insists that this recent creation by the folks over at Evil Mad Scientist Laboratories is a tribute to him, [Ralf Hütter and Florian Schneider] beg to differ. 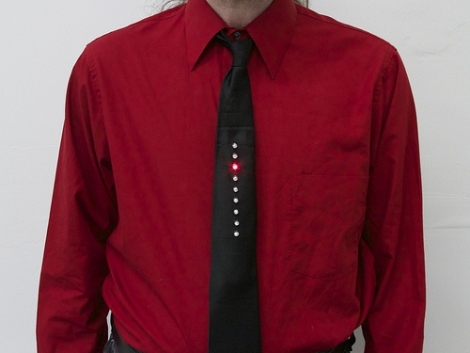 The inspiration for the tie actually comes from Kraftwerk’s 1977 video for “The Robots”, in which the band wore black ties with embedded scrolling LEDs. 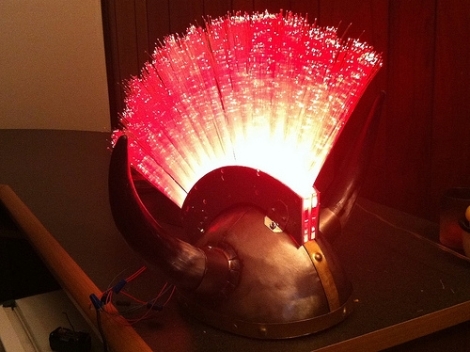 The effect is very similar to that of a Larson Scanner, though Kraftwerk’s ties light the LEDs in a single direction and do not fade in and out. 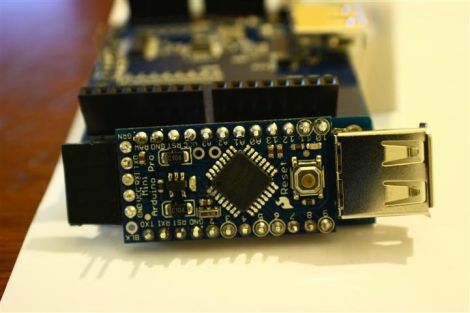 EVMSL has released a firmware update to the Larson Scanner they sell in their shop that replicates the Kraftwerk effect, and they also put together a quick tutorial showing how you can construct your own coin cell-powered LED tie. We’re not suggesting that anyone rush out and buy their kit, as it can be replicated fairly easily – we just thought it was pretty cool. So, if you’re looking for a retro-inspired Halloween costume, search no further – Evil Mad Scientist Labs has you covered. Continue reading for a video demo of their tie, as well as the original video that inspired it. [Urpo Lankinen] has a father who is a huge movie buff, and once you care deeply about something it begins appearing everywhere you look. While driving on a back-country road one day, [Urpo]’s dad noticed that the shadows of the trees on the road looked like an optical film soundtrack, so it was up to the son to make it happen. Early sound-on-film technologies like the RCA Photophone, and Movietone recorded audio onto the film stock with a variable area exposure. This exposure corresponds to the waveform of the audio signal. [Urpo] figured that his small digital video camera served the same purpose as the audio sensors inside the projector, so he put a piece of tissue paper over the lens and wound up with a video that was just frames of gray. [Urpo] built an app in Processing that averages the pixels in each frame of the video. Of course, recording at 30 frames/second won’t produce any audio this way, so he modulated a triangle wave with this data in Audacity. In the end it really doesn’t sound like much, but it’s great to see such a geeky build. We’d love to post the video after a break but [Urpo] doesn’t believe in YouTube embeds. We’ll honor his wishes, so you can check out the video here. [Adam Ben-Dror] recently tipped us off to a project that he worked on recently. 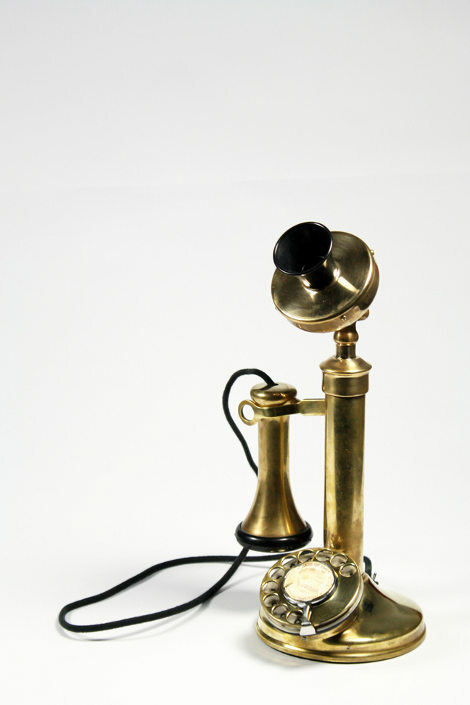 In this build he gutted an old candlestick-style phone and added modern technology to make it work as a cordless phone. We really liked this project because he married together new and old technology into an elegant package. There are a few hacks that he had to perform to get this to work. One was converting the rotary pulses into DTMF tones. The other was making the cordless phone that he gutted recognize when the phone was on or off of the hook. 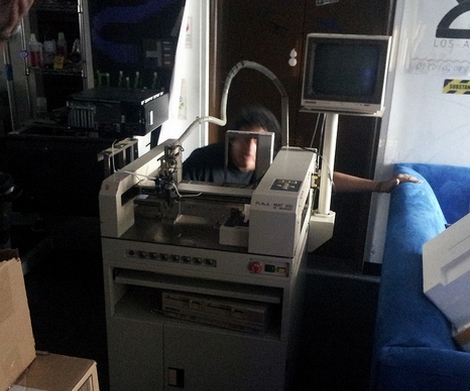 Professional-grade pick and place machines are quite pricey, so when the crew at Null Space Labs picked up an old Juki Placemat 360 for only $1,200, they were stoked. When they finally got it in-house however, they realized that the seller’s definition of “working” was a bit different than theirs. The machine’s compressor is busted, and there are all sorts of other bits that require some TLC before they can get things up and running again. They have put together a “build log” showing off their work as the machine is taken from an ancient, mostly-working relic to a lean, mean, picking and placing machine. So far, they have torn the thing down and inspected the upgrades and damage the machine has been subjected to over the years. The crew started making a few small repairs, and have even replaced the unit’s laser with machine vision, which seems to be working well thus far during testing. While you might not have any similar machinery in your workshop, it’s still fun to watch as they tear it down and revamp it, bit by bit.